The completion of a Lesson Book and graduating to the next level is a very important step in the growth of a piano student. At times, it is beneficial to take a short break to play some new pieces that use the skills recently perfected. 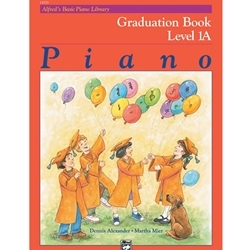 The Graduation Books contain captivating solos that students can perform without having to learn something new. Because the students will know everything needed to play any piece in their level, they may play them in any order they wish.